No major change in 250 years. Well, something must be awfully wrong with their science. The exact opposite is true. (And the same has happened with the temperature, storms, global sea ice, and snow cover predictions). 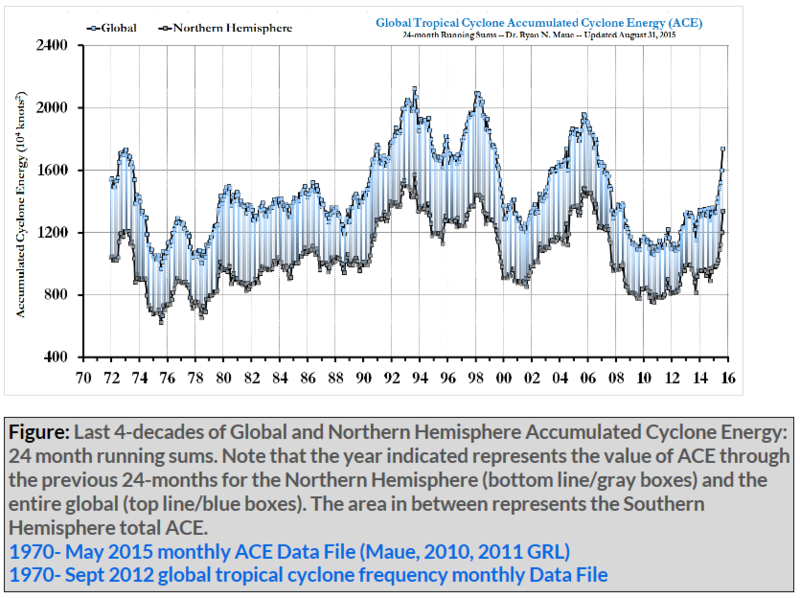 (ACE) index over the past four years is at a 45-year low and the trend has been in steep decline since 1990. 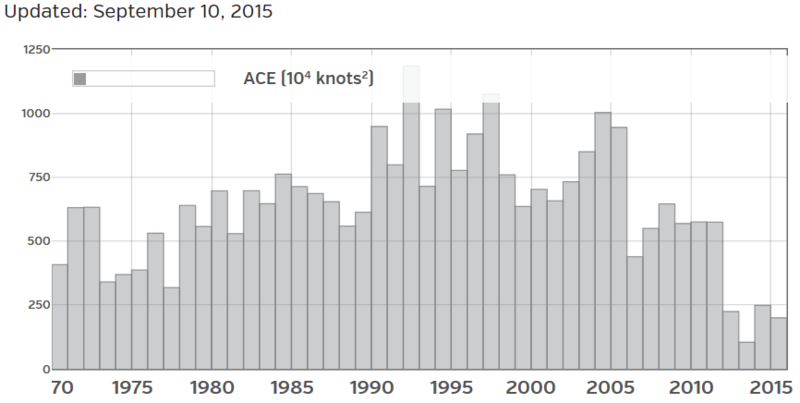 Turns out there were 6 storms in 2015 with more Accumulated Cyclone Energy (ACE) than Patricia !! Seems the only records Patricia broke, is for amount of hype & misinformation/ lies generated. http://www.wunderground.com/hurricane/accumulated_cyclone_energy.asp?bas… There are ten notes at the bottom of that page that give some observations about ACE and cyclone actions. Since Hurricane Katrina struck the USA Gulf Coast on Aug. 29, 2005, climate activists have beat a steady drumbeat warning of doom. “Global warming is ‘causing more hurricanes’“, The Independent, 2012. “A Katrina hurricane will strike every two years“, ScienceNordic, 2013 — About a widely reported study in PNAS by geophysicist Aslak Grinsted of the Niels Bohr Institute Copenhagen U. Also see “‘Katrina-Like’ Hurricanes to Occur More Frequently Due to Warming” in US News & World Reports. “Hurricanes Likely to Get Stronger & More Frequent“, Climate Central, 2013 – About a study in PNAS by Kerry Emanuel et al. See ten even more outlandish predictions from the big 3 networks. We should distinguish between the research done by scientists; against the unbalanced reporting of research by nonscientific hack journalists, and exaggeration of their findings by activists. Science advances by bold predictions, valuable no matter what the result. Of course, studies are news. But journalists often do not state the long-term scope of these forecasts, hide the uncertainty, and show only one side of the debate among scientists. There were balanced articles after Katrina, but too few to counterbalance the alarmists. This 2 page article explains the real reasons why Katrina was so devastating (clue; NOT global warming). 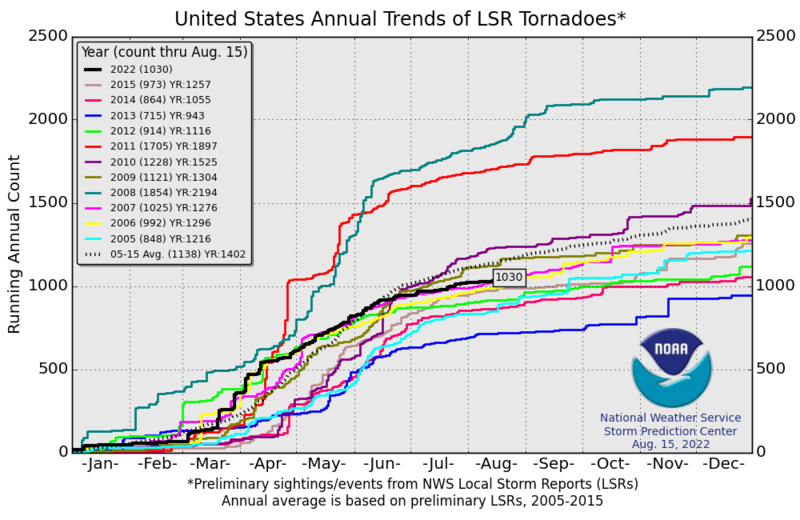 Totals for Aug 2016: Bottom line ► Atlantic and Northeast Pacific = 42. Top line ► Rest of world = 83. As was seen in 1900s-1920s & the 1970s -1980s. 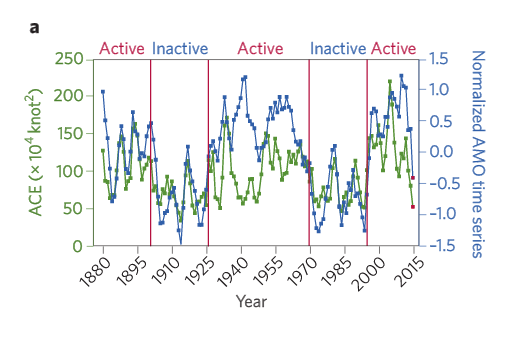 Analyses of Atlantic Multidecadal Oscillation (AMO) variability. Three-year-averaged ACE (green line) and three-year-averaged standardized normalized AMO (blueline) from 1880–2014 with predicted value for 2015 (red squares). The 2015 AMO value is the January–June-averaged value. The year listed is the third year being averaged (for example, 1880?is the 1878–1880 average). Correlation between the two time series is 0.61. For instance – Prior to 1960, wildfires in the US burned far more acres than they do now. 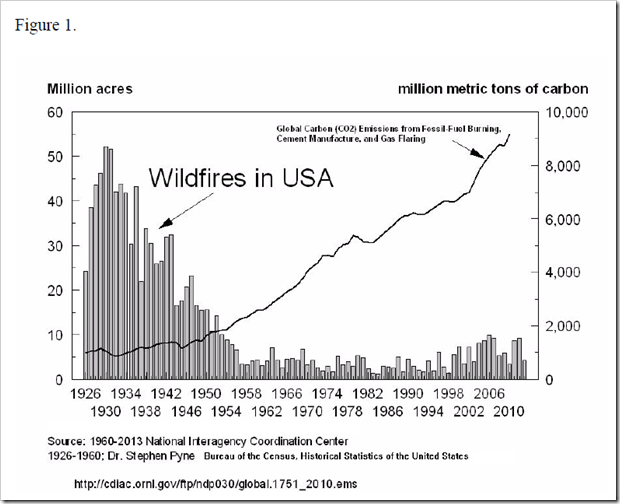 Maybe the Wildfires chart is showing why they use CO2 for fire extinguishers ?? Lets build on ‘flood plains’ (the clue in the name), if they flood, blame act of God or…. climate change !! 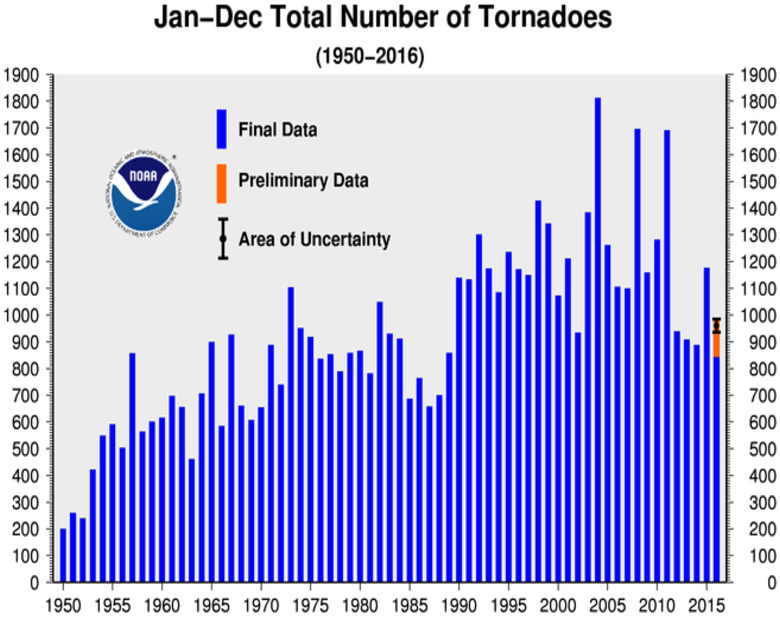 Despite common perception Weather events have not increased over time… but observation & recording have. The Foss flood barrier failed on Boxing Day 2015 because the EA (to save money) had put all the electrical gear BELOW known flood levels. !! Interesting piece on land drainage.